We will be taking a break until late January 2016. If you’ve never been to a book launch, add it to your ‘To Do’ list now! MEETING THE TALENT. Meet the author and illustrator. NEW BOOKS. Buy your own copy AND READ IT while it’s hot off the press. BOOK SIGNINGS — get the book signed by the author or illustrator (or both!). INSTANT FAME! While the author or illustrator is signing your book is the perfect time to take a photo. Get in the photo too. Famous! THE DOOR PRIZE. Not every book launch offers a door prize, but some do! You could win stuff just by turning up. TALENT SPOTTING. Keep your eyes open for other authors and illustrators in the crowd. While you’re waiting to have your book signed you might even chat to one standing in the queue in front of you. More photos! MORE NEW BOOKS. Buy another copy. And another one. Ask the author or illustrator to sign it “To [your friend’s name]”. Birthday presents sorted! BOOK LAUNCH CAKE. Quite often there’s cake. Who doesn’t like cake? Keen to go to your first book launch? Good news! There are book launches happening all over the country. Check out the BOOKISH EVENTS tab on our blog for news of upcoming book launches near you. The next school holidays aren’t far away. If you live in NSW, we’ve heard that The Children’s Bookshop will be hosting some fabulous school holiday workshops for young readers, writers and actors. Join Deb for a morning of writing fun as she reveals the secret to creating your own great stories. Then stay to celebrate the launch of New City, the sequel to her bestselling book, Grimsdon. Food and drink provided! Cost: $50 per student . All materials are provided. Book early! Join Geoffrey McSkimming, author of the Cairo Jim chronicles and the new Phyllis Wong mysteries, for a fun morning looking at how to create and flesh-out characters. Cost: $50 per student. All materials provided. Book early! Share the stories and adventures of Wally from the Where’s Wally series. Lots of craft and art activities for the kids and a Where’s Wally show bag! Wally will be visiting and the kids will be asked to find Wally in Beecroft at the end of the workshop. When: Wednesday, 1 October 2014, 9–11am, then a Search for Wally between 11–11-30am with prizes! Cost: $30 per student. All materials provided. Book early. Run by our resident drama teacher and Shakespeare enthusiast! A drama workshop full of fun and creativity — come and play with one of Shakespeare’s great comedies and discover Disguise, Fools, Forgery and Yellow Stockings. A hands-on and FUN workshop! If you love picture books and you can get to Canberra — here’s an exhibition you really must see! Bob Graham is one of our favourite illustrators. You’ll recognise his artwork from picture books like How to Heal a Broken Wing, Let’s Get a Pup, Max … and heaps more. Now you can see his work in an exhibition, including sketch books, manuscripts, memorabilia and illustrations. Items in the exhibition have been selected from his studio and from the Lu Rees Archives at the University of Canberra. Over the next few months, you can meet Bob Graham, take art workshops and sign up for school holiday workshops. Find out more at the Museum and Galleries website. 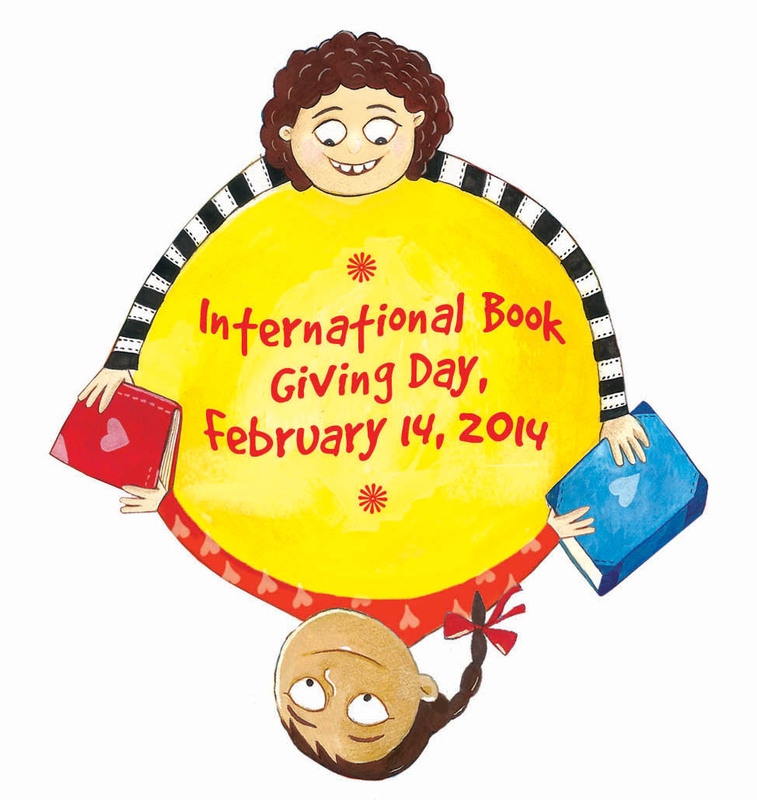 Today is International Book Giving Day (and Valentine’s Day — but we’re all about the books!). We’ll be donating books today and our editor will be giving books to family and friends. If you plan on giving a book to someone (or leaving a book in a waiting room or lobby) you might like to include this cool IBGD bookmark inside the book. It’s free to download and print it. 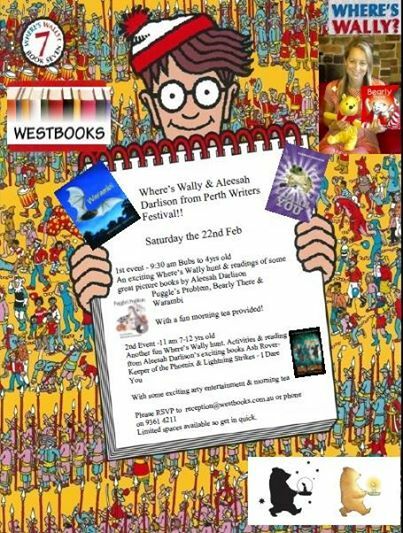 Saturday 22 February 2014 at Westbooks, 396 Mill Point Rd, Victoria Park WA 6100. 9.30am bubs to 4 year olds — an exciting Where’s Wally hunt and readings from some great picture books by Aleesah Darlison (Puggle’s Problem, Bearly There and Warambi). Morning tea provided. 11am 7 to 12 year olds — Where’s Wally hunt, activities and readings from Aleesah Darlison’s Ash Rover Keeper of the Phoenix and I Dare You, with some arty entertainment and morning tea. RSVP to reception@westbooks.com.au or phone 9361 4211.